For 2015, The New York Times named Heritage by Sean Brock as the "blue ribbon chef cookbook of the year." Following his ingredient list and clear instructions, I adapted the recipe for roasted cauliflower. The first clue this was going to be fantastic was the aroma of the star anise in the vegetable stock. The whole cauliflower browned beautifully after 20 minutes of ladling butter and oil over it. The brown butter sauce with leeks smelled delicious, and the coconut cream (substituted for dairy) and cauliflower pieces pureed in the blender tasted fresh and complemented the other ingredients perfectly. The result was a mélange of flavors that would make any amateur cook feel like a 3-star chef! 1. In a food processor, chop small batches of the leeks, onion, fennel, celery and garlic until they are the size of peas. 2. In a stock pot, heat the grapeseed oil over medium-high heat and sauté the vegetables until just tender, about 5 minutes. 3. Add the water, grape juice, star anise and bay leaf. Bring to a simmer and skim off any impurities on the top. Reduce heat to medium-low and simmer for about 45 minutes. Add more water if necessary. Stock should be fragrant and rich in color when done. 4. Pour the stock into a colander lined with cheesecloth that has been placed over a bowel or pot. Discard the vegetables in the cheesecloth; do not squeeze excess into stock. 5. Put the stock in the refrigerator for about an hour to cool down. Skim off any residue on top of the stock. 1. Fix a small metal cup or cookie cutter to the bottom of the whole cauliflower. Put in a stock pot. Generously sprinkle the cauliflower head with kosher salt. Add the butter and oil and heat to medium high. 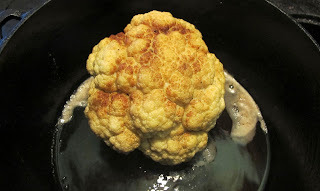 Spoon the oils continuously over the cauliflower head with a ladle until it is well-browned, about 20 minutes. 2. Move the stock pot with the cauliflower to the pre-heated oven. Bake for 10-15 minutes, until it pierces easily with a fork. 3. Remove the cauliflower from the oven and let stand for 10 minutes. 4. Cut off the stem and set aside. Starting at the top of the cauliflower, slice 1/2” pieces through the head and place on a greased baking sheet. Return to the oven to stay warm and finish cooking through. 5. 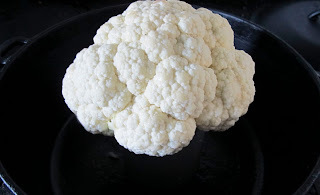 Chop the stem into small pieces, and set aside with other cauliflower pieces that are leftover from the slicing. 1. Heat the butter in a skillet over medium-high heat until it turns brown and smells slightly nutty, about 8 minutes. Remove from heat and stir in lemon juice until emulsified. Return to low heat and add the turmeric and leeks; cook about 2 minutes to blend flavors and slightly wilt the leeks. Set aside and warm up later. 1. In a small sauce pan, add the extra cauliflower pieces and chopped, peeled stem. Pour 2 cups of vegetable stock over the mixture, or enough to cover the vegetables. Bring to a simmer, add the coconut cream, and stir until heated through. Put everything in a blender and puree, about 2-4 minutes. Add salt and black pepper and mix to combine. Cover the area on the plate for the cauliflower with coconut cream sauce. Arrange the cauliflower slice(s) on top. Reheat and spoon the leek sauce over the cauliflower. Drizzle a bit more coconut sauce on top. Garnish with water cress, lemon zest, and red peppercorns. Serve warm.